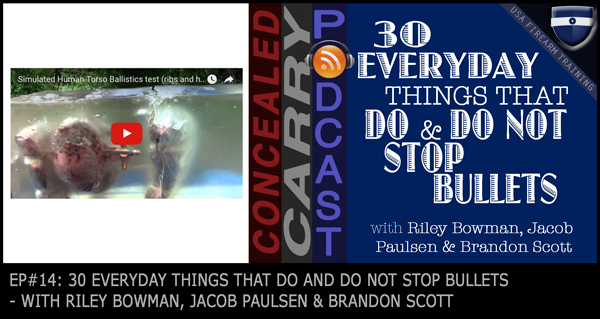 A lot of people understand the basic idea of cover vs concealment BUT can you readily identify things in your home and workplace that would stop a bullet. We discuss these objects. Today’s episode is sponsored by the USA Firearm Training Patriot Membership. Membership costs $10 a month and gives the member 10% off all purchases on USA Firearm Training. That includes purchases on ammo, holsters, lasers, sights, apparel, training, books, and more. Check it out at www.concealedcarry.com/patriot and start saving on your purchases today! Great show! I love listening!, question, how long is it recommended to keep carry rounds before you should replace them? Do bullets go bad? That is a great question! Maybe we should talk about it on an upcoming episode. While it’s difficult to say for certain how long ammunition is good for, it is my routine to rotate through my daily carry ammo every 6 months MINIMUM. Being in law enforcement, I have to qualify on my firearm at least once every 6 months (I usually qual more often just to stay sharp and to make sure I don’t run the risk of my qual card expiring ever). So what I do is shoot my duty/carry ammunition that I’ve been carrying for the past 4-6 months and replace it with new. You know what? I’ve never had any of that self-defense ammo fail to fire! So it is obviously still good at the time. But ammo that is being loaded, unloaded, and carried on a daily basis for that period of time takes a real beating! It is good practice to try to not load the same round into the chamber each time that you make your gun ready for carry. Obviously you are going to only have so many rounds, and over a several month period it is inevitable that you are going to have to use the same one a few times. That’s why periodically I pull all of my self-defense loads out and inspect them. Check the bullet, check it’s seating in the case, check the primer, make sure everything looks right. I check the overall length to make sure they’re within spec. It’s real easy to line them up on a table in a line and place your eye level with them and look for any that are too long or (more commonly) too short. If any round looks bad or damaged or out of spec, toss it. Modern ammunition if stored properly in a cool, dry environment will probably last longer than you or I will be alive, but daily self-defense ammo will need to be taken care of and periodically rotated through–like food storage!